The Funky Felter: Happy to be part of the Eclectics family! Happy to be part of the Eclectics family! I found out this morning that a local artists' co-op, Eclectics Gallery, juried in my felted creations for consignment. Yay! I'm happy to now be part of such a wonderful local shop. It represents a wide variety of talented local artists and crafters. My fellow artisan, Cindy of Cinderelish, contacted me about submitting my items for review. I'm very thankful to her for all her wonderful encouragement. If you'd like to know more about Eclectics Gallery and their artists, please visit the shop's blog. Also, if you are local and looking for birthday or holiday gifts or just a little something special for yourself or someone else, it is a great place to shop. It is located at 7015 Oak in Kansas City, Missouri, and is open from 10:00 am to 6:00 pm Monday through Saturday. 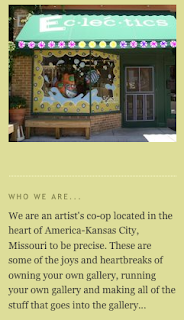 Stop by and see what the talented local artists and crafters of KC have to offer! Thanks for mentioning Eclectics in your blog. We are all very excited to have you as a new consignor and can't wait to see the goodies you bring. I went ahead and added your blog to the Eclectics blogroll.